Play Guitar!!!! your own way and develop your own personal style. You can learn a lot about playing the guitar by listening and copying other musicians but it is important to play guitar your own way too. Let your mind flow and wander as you learn to play guitar licks. Add your own flavor and your own style. Think of ways to add pull offs and hammer on technique while you work on your finger dexterity. 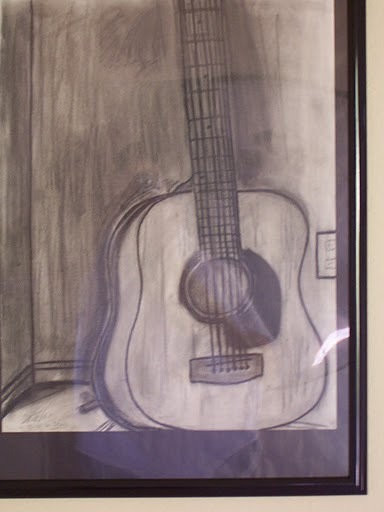 Playing guitar is a creative process and it is part of the joy of playing. It is your imagination that will bring out the best of your playing. If you learn the basic scales well enough you will be able to let your creativity flow without conscious thought. You will gradually develop the true ability improvise and just play guitar. This article from pentatonicscales.org gives great advice on how to improve your finger dexterity and how to learn to play guitar like the pros. check out the link after reading the following paragraphs and start practicing today. Pick out the key for the pentatonic scale type in “backing track in key of A for guitar” for example and see what comes up. You will find several different options based on the type of jam you want to play and the speed of the beat. Check out a couple different tracks and start jamming on your pentatonic scales while incorporating some riffs, licks and bends and listen to the tone and pitch. If you can tune your guitar with a pitch pipe you should be able to hear the notes that are in or out of key. When you are doing your bends in the pentatonic scales you have to be especially aware of the pitch of the bend. The bluesy sound of the blues comes in part from the bending of the strings to add emphasis and feeling. However, bending of the guitar strings will change the pitch of that note and it can bring the note into or out of the proper key. The only way to keep the pitch of the note in the right key when bending notes in the pentatonic scale is by ear and therefore by many hours of practice with backing tracks. 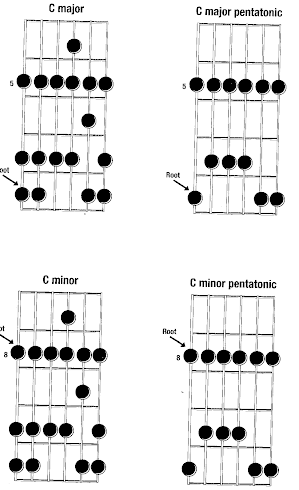 The Pentatonic Scales in the minor form are the most commonly used scales in rock and blues music. The "enhanced" version of the minor pentatonic scale is the staple of the Blues. This "Blues" Scale adds the Flat 5th note to increase the melodic sound and versatility. This version of the scale is much more fluid and flowing and easier to manage while fitting notes into the overall melody. The Flat Five note is often referred to as the Blues Note and if you play the standard version of the minor pentatonic and then play the minor pentatonic blues scale you can easily recognize the Blues sound. You can always find ways to improve or to get lessons. Check out the guitar lessons HERE and get a few free guitar lessons to help get your creativity flowing better everyday HERE. If you practice this scale with a 12 barre blues backing track you will be able to create the unique blues sound. Try to emphasize the most melodic sounding notes the most as you hold and sustain them for emphasis and phrasing. Blues playing is all about the feeling you can express through the fretboard. You can emote through the music as you learn the proper placement and timing of your string bends and held notes. Practicing the Pentatonic Scales with the added blue note will be very beneficial to your guitar playing skills. Keep expanding your knowledge and you will get better everyday. Even if you are already a very skilled guitar player you can find new tips and tricks to improve your playing. Continual search for musical knowledge is the best way to become more professional and more skilled as a guitar player. Make the effort to apply everything you learn in your practice as soon as you can and then keep it in your practice sessions daily until you have mastered the new technique or new riff. Visit the previous post for the full version of the Pentatonic scales that is great for practice.